Wide-legged cropped pants, commonly known as culottes, might have you scratching your head at how to style them. However, did you know that there are tons of ways to make these super comfy pants look elegant, stylish and more appealing? 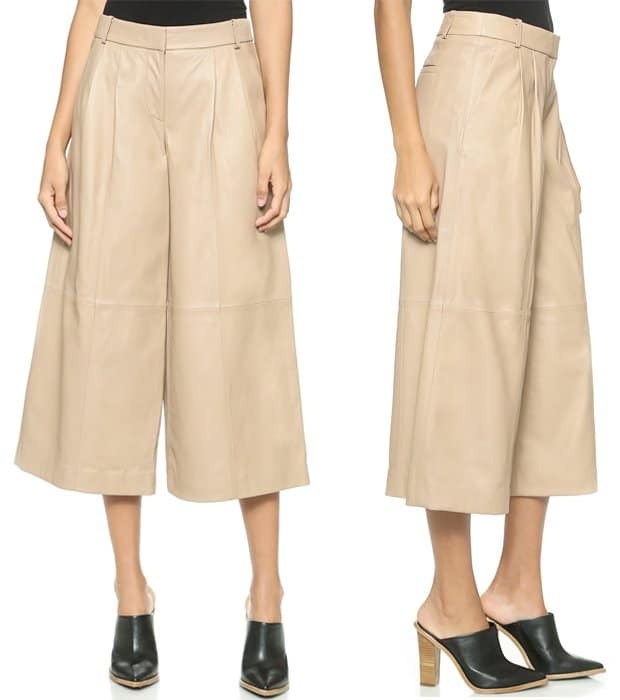 While culottes have been making a major comeback recently, you may be surprised to learn that they’ve been around since the late Middle Ages. Originally worn by gentlemen of the European upper-classes, culottes were normally closed and fastened about the leg, to the knee, by buttons, a strap, and buckle, or a draw-string. 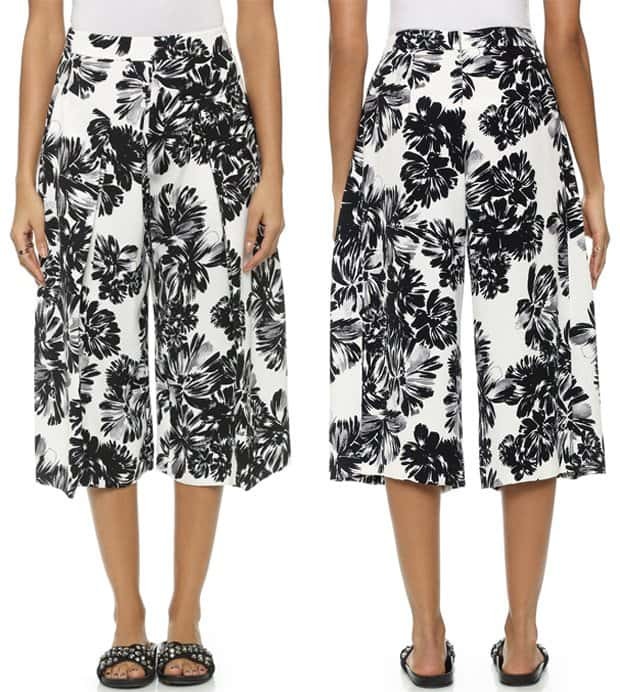 Culottes can make a great style statement without compromising your comfort. Perhaps these celebrities will convince you to give them a chance. The 36-year-old looked ready to conquer the world in her tan culottes that she wore with a long coat, white button-down shirt and a pair of metallic pumps. This outfit can easily turn into your workday favorite! The American Idol judge went to work wearing chic Alice + Olivia high-waisted pleated gaucho pants. She teamed them up with her Naeem Khan Pre-Fall 2014 gold chain top and Giuseppe Zanotti suede ankle-strap platform pumps. The embellished top added just the right amount of wow factor to her look! The British singer saw it fit to match her Whistles ‘Hoshiko’ patchwork culottes with a matching Whistles ‘Mitsu’ bandeau top. With that much confidence, even a completely matchy ensemble is stylish and chic. When leaving the event, Rita Ora also rocked a ‘Hoshi’ check coat from the same brand and a pair of Fendi ‘Iridia’ PVC ankle-strap sandals. The TV personality recently launched her new line of nail polish wearing black Vilshenko ‘Tania’ wide leg cropped wool pants and a matching embroidered wool Vilshenko ‘Sofia’ jacket. The ‘Mockingjay’ actress also rocked a pair of culottes during Paris Fashion Week in a head-to-toe Christian Dior ensemble. She partnered the flowy charcoal wool pants with a pink cropped top. As for David Beckham’s better half, she wore her Victoria Beckham culottes with a cropped white shirt and cropped knitted vest also from her fashion label. She capped off her look with a pair of Casadei ‘Blade’ suede pumps. The popular American actress wore a belted Brunello Cucinelli jumpsuit with ribbed knit bodice and poplin legs. Mila Kunis styled the look with Santoni ‘Brigitte’ ankle strap sandals, earrings, and bracelets by EF Collection and EFFY Jewelry, as well as rings by Sara Weinstock and Graziela Gems. We don’t know about you but these outfits made us want to try wearing culottes. We even spotted some cute pairs in our favorite stores. How would you like to wear these? Deep pleats and a wide-leg silhouette lend a relaxed feel to fluid, mid-weight crepe Rebecca Taylor culottes. A painterly floral print rendered in muted tones lends graphic versatility. 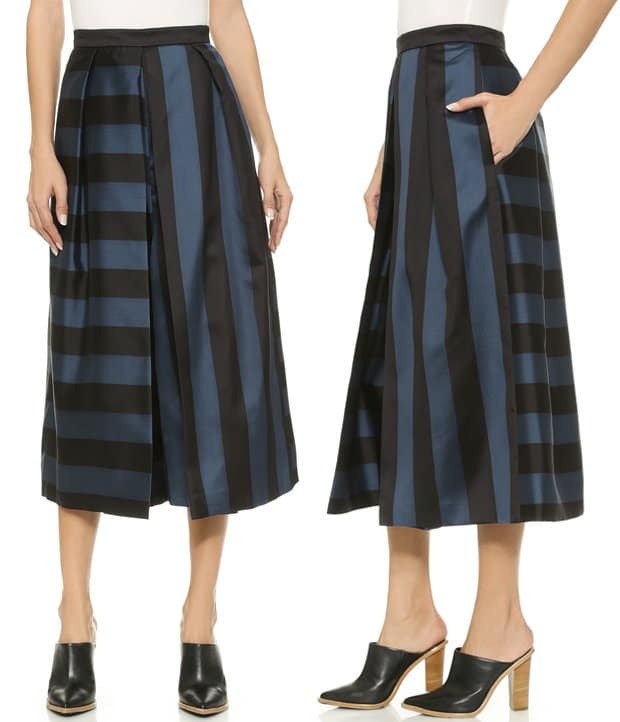 Deep pleats create a cool, swingy profile on these striped Tibi trousers. 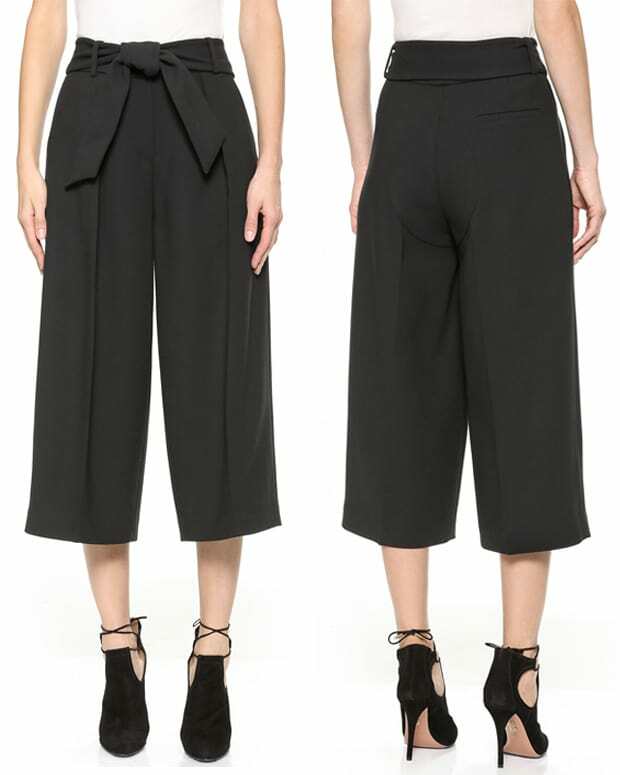 These cropped Solace London pants have an exaggerated, wide-leg profile for dramatic volume. Pleating accentuates the cropped, wide-leg cut of these leather Tibi pants. 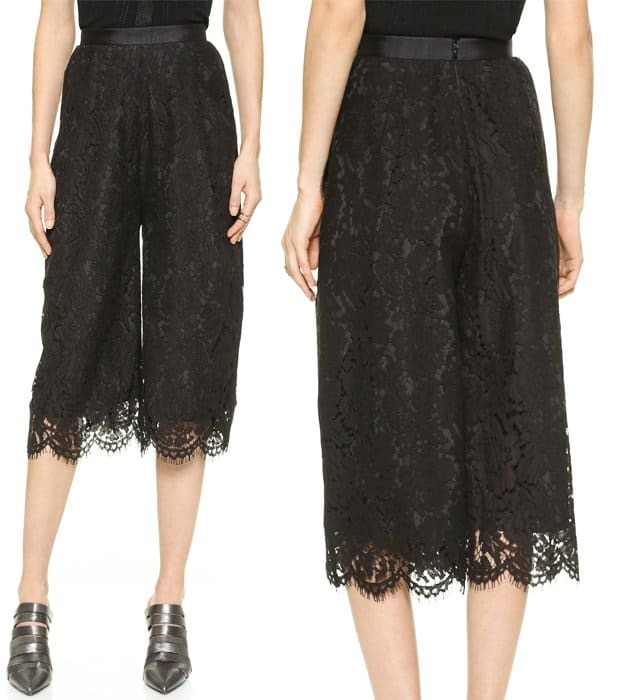 In this season’s modern length, these lace pants are sure to become a wardrobe staple. These creased ISSA trousers have modern proportions with a cropped, wide-leg profile. 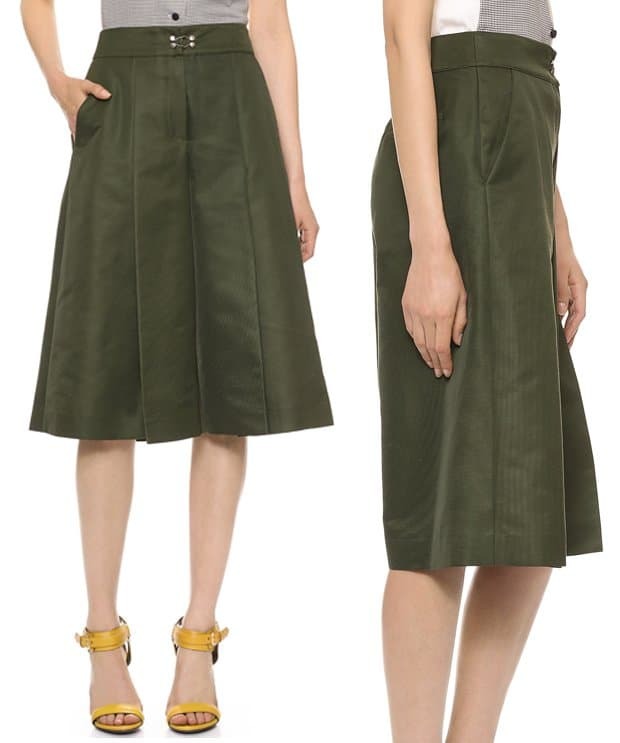 Rich, substantial faille composes these Creatures of the Wind trousers, which cut a retro, wide-leg silhouette. Who do you think looked best in culottes? Let us know by leaving a comment below!